I was looking for an open source polygon clipper library for AS3 to use on a commercial project. I found a few ports of the General Polygon Clipper library (GPC) but it is only free for non-commercial projects. After more searching around I found this excellent library called Clipper by Angus Johnson. It did not have an AS3 port so I made one using Alchemy to wrap the c++ code. It is completely free and open source for both personal and commercial projects. Clipper uses the Boost Software License. 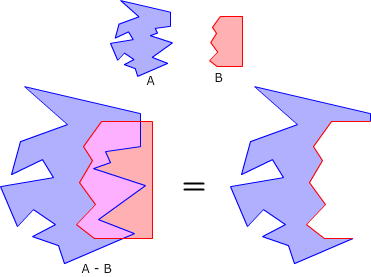 Supported clipping operations: difference, intersection, union and XOR.